News about Nexus, the three-day ParishSOFT users' conference held annually at destinations around the United States. 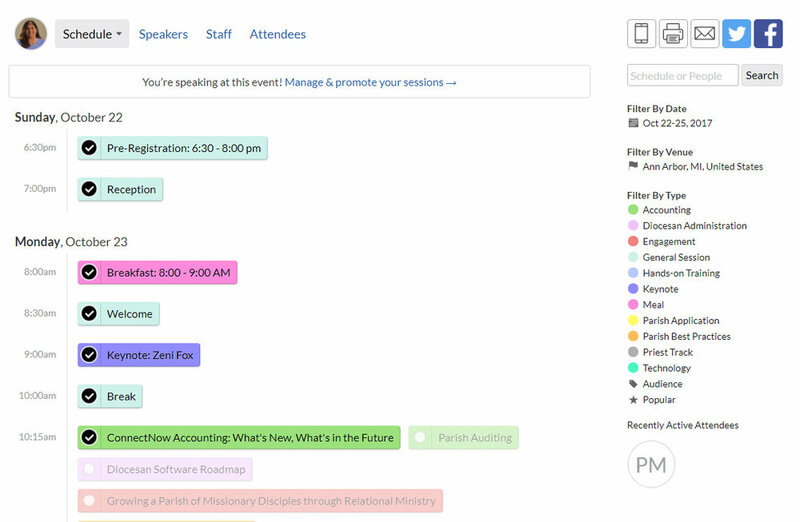 The conference offers workshops for parish priests, administrators, bookkeepers, and religious education directors as well as diocesan leaders, accountants, and those who implement and support ParishSOFT products throughout their diocese. The keynote speakers are Catholic thought leaders and authors. Foundational to ParishSOFT, and consequently our Nexus users’ conference, is the church – you. As workshop presenter Lisa Sliker reminded us, “Church is not only the pastor and the people, it is the people for and with the people.” We are the disciples; we are the church. Place tools in the hands of disciples on fire for the mission of making the Gospel known, and creativity and innovation are boundless. But first, tools must be learned and explored, and strength drawn from lived experience and fellowship with each other. More than 50 Arch/Dioceses to be represented at Nexus 2017! We're counting down the days until the users' conference and as registrations continue to roll in, we're counting up the number of arch/dioceses that will be represented this year! Parish and arch/diocesan staff from more than 50 Catholic arch/dioceses will be present at Nexus 2017! Congratulations to our early bird contest winners! Are you still thinking about registering for this exceptional event? Register here and you can save $126 per registrant, compared to our standard rate, until September 15. Looking to save money and attend Nexus? Read some great tips on how you can save your parish or diocese money by registering before September 15. As you plan your trip to this year's users' conference, we have some suggestions on things to do before, during, and after Nexus. We look forward to seeing in October at our users' conference! Over the last few months, we have discussed the benefits of attending Nexus. If you missed out on our early bird discount and specials, you can still attend Nexus and save your parish money. Also, if you need help you justify the cost for your parish or diocese and overcome those pesky financial hurdles so you can attend this year’s users’ conference. Register for the users’ conference by September 15 for our discounted rate: $479 per registrant. This saves you $126 per registrant compared with our standard rate of $625. We have extended our specials until September 15! Register for Nexus and if you pay for three staff members from your organization, the fourth registrant is free! Or, parishes may register one priest for free with just one paid staff registration! Is your parish or diocese within a few hours’ drive of Ann Arbor, Michigan? If so, consider driving instead of flying! Not only will you save your church a lot of money that would otherwise be spent on airfare, but also the time with your colleagues is an opportunity for fellowship and will undoubtedly result in bonding. Ask around in your diocese to see if you can carpool with others from nearby parishes or perhaps rent a vehicle and split the expense to cut down on transportation costs. If your parish or diocese is too far to drive, fear not. You too can save money on travel costs. Websites such as Cheapair.com and Expedia.com are good places to potentially save on your airfare costs. A smart way to save money is to consider sharing your hotel room with others from your parish or diocese. Sharing a hotel room can reduce the cost of attending quite substantially. Plus, spending more time with your colleagues will be a fun way to get to know them better outside of work. Once you have determined how you want to save money, don’t forget to take a look at our resources for dioceses. These resources are useful even if you are a parish. For example, we have included a sample justification worksheet that you can use to educate decision makers as to why attending Nexus is quite simply a smart investment. With so much to do in the area before, during, and after Nexus, have you considering extending your stay? Take a look at our recommended list of things to before, during, and after Nexus. We can’t wait to see you at Nexus this year! If you have any questions about Nexus, please contact us anytime – we are here to help!